To establish a human colony on Mars, scientists wouldn’t just need water--they would need plentiful water, most of which would go to farming. Hoping to determine is specific plants would last in Mars’ environment, ecologists recently created soil simulants that model the planet’s soil. 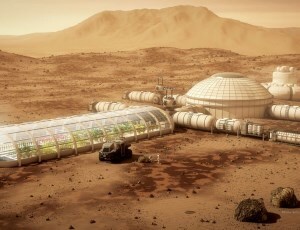 Martian soil contains all the nutrients plants need to grow, and promising results from tests of crops here suggested that after 50 days, more plants would be alive in a Martian greenhouse than in a greenhouse on Earth. But if the results of this study are to be replicated on Mars, the planet’s soil would first need to be engineered to be more water-efficient and nitrogen-rich. Everybody breathes--it’s the most effortless thing to do. But how would people breathe on Mars? This is another concern that must be addressed before humans can hope to live on Mars. Scientists would theoretically use the Martian atmosphere, collect carbon dioxide from it, compress it, and then use electricity to reduce it down to usable oxygen. This would create carbon monoxide molecules as a byproduct and, as such, serve as one possible method that scientists could utilize to manufacture breathable air on Mars.